Tyrunt in game: 13,216 Who? Important notice! Pokemon Tyrunt is a fictional character of humans. Tyrunt (Japanese: ???? Chigoras) is a dual-type Rock/Dragon Fossil Pokémon introduced in Generation VI. 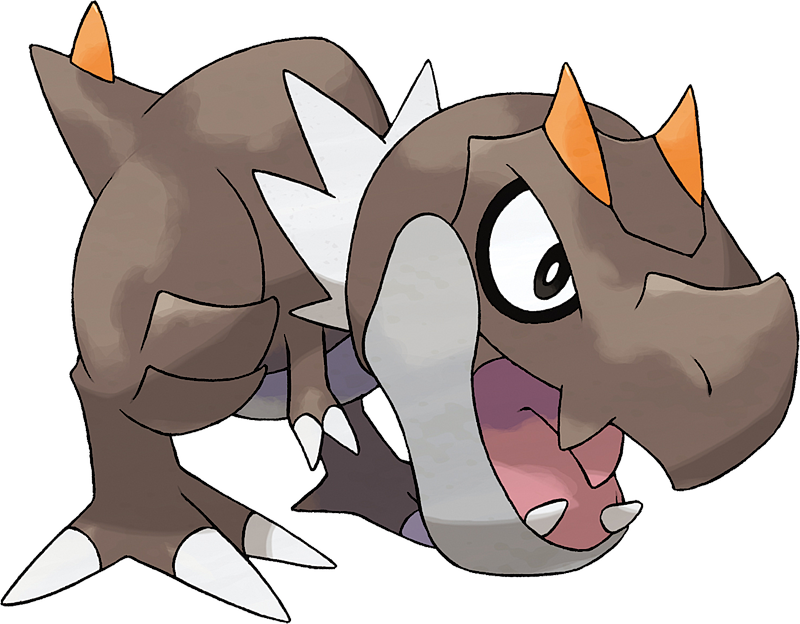 It is resurrected from a Jaw Fossil and evolves into Tyrantrum when leveled up during the day starting at level 39. 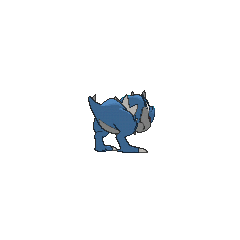 Tyrunt are dinosaurian Pokémon, closely resembling theropods such as Tyrannosaurus. Their bodies are grayish-brown, with a lighter gray shade on their bellies and lower jaw. The back comes to a peaked hump, and the tail is short and pointed. They have tiny forelimbs with only two clawed digits, both white. The hind legs are more robust, and its feet feature three white claws and an adjoining rear claw; this fourth digit is stone colored. The front part of each leg also features two, armor-like plates, which are rectangular in shape. Spiky, white structures, similar to the primitive feathering on many dinosaurs, extend from the back of the neck. Their heads are proportionally large, with a ridged snout and powerful jaws. They have two pointed teeth in the lower jaw, and the upper jaw features tooth-like projections on either side and a slightly-decurved hook at the end. Their large white eyes are semicircular with a black border along the lower curve. Orange, triangular horn-like crests extend from above each eye and point away from the snout, and a similar projection juts out of the tail. 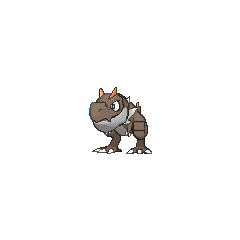 Tyrunt will throw tantrums and run wild if it encounters something it does not like, and its strong jaws have enough force to shred an automobile. This Pokémon lived 100 million years ago. Tyrunt made its debut in Climbing the Walls! under the ownership of Grant. Tyrunt defeated both Froakie and Fletchling until being bested by Pikachu. A Tyrunt appeared in the Pikachu short Pikachu, What's This Key?. Multiple Tyrunt appeared in The Tiny Caretaker!, under the ownership of several Scientists; one of them is stolen by Team Rocket, but escapes and is found by Bonnie, eventually evolving into a Tyrantrum to save her. A Tyrunt appeared in Diancie and the Cocoon of Destruction. XY025 Tyrunt Ash's Pokédex Tyrunt, the Royal Heir Pokémon. Tyrunt's jaws are so big and powerful, it can crunch up a car. If it doesn't like something, it responds with a wild tantrum. XY087 Tyrunt Ash's Pokédex Tyrunt, the Royal Heir Pokémon. When unhappy, Tyrunt will go on an angry rampage. It evolves into Tyrantrum. A Team Flare Grunt owns a Tyrunt, which he used to retrieve the Manectite Mega Stone from Clemont in the X & Y chapter. This Pokémon was restored from a fossil. If something happens that it doesn't like, it throws a tantrum and runs wild. Its immense jaws have enough destructive force that it can chew up an automobile. It lived 100 million years ago. Moves marked with a superscript game abbreviation can only be bred onto Tyrunt in that game. 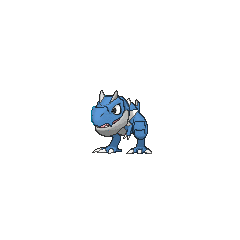 For other sprites and images, please see Tyrunt images on the Bulbagarden Archives. No other Pokémon has the same type combination as Tyrunt and its evolution. 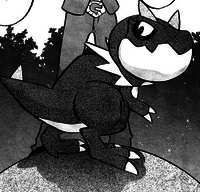 Tyrunt and its evolution were designed by Hitoshi Ariga. 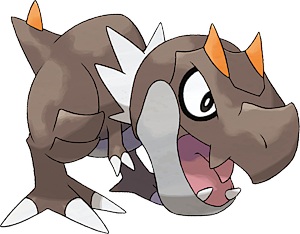 Tyrunt seems to be mostly based on juvenile Tyrannosaurus, though it also shares characteristics with Gorgosaurus (like the orange crests above each of Tyrunt's eyes). 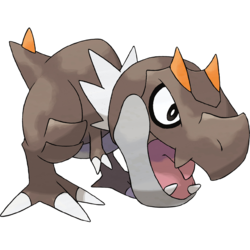 Tyrunt is a combination of Tyrannosaurus, tyrant, and runt. Chigoras may be a combination of ?? chigo (baby) and Tyrannosaurus. It may also derive from ??? chisai (little) or ?? chibi (runt).